The Housing system in Albion Online consists of building things. Building your home is a big part of that experience. 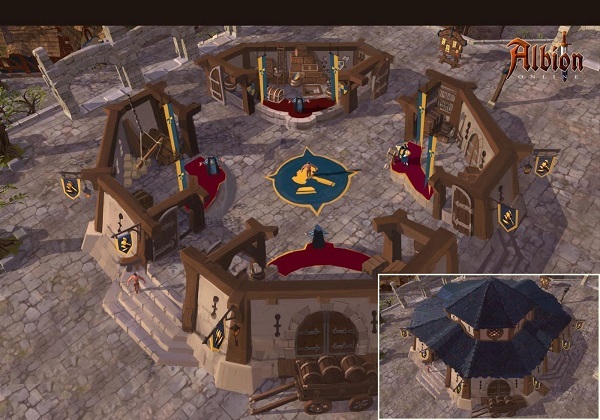 However, the Albion Online housing system does not consist solely of having a decorated house. The developers, in fact, have entered the laborer system that will fill your home with life, give it a purpose, and give the player something to do with their home. The Laborers (the workers) can perform a series of tasks, and this allows you to choose according to your style of play. If you are a gatherer, you will probably want to fill your house with gathering laborers (wood, stone and ore). To assign a task to a laborer, you'll have to give him a journal. The journal is an item that you can buy directly from your worker. For example, a woodcutter will sell you a woodcutting journal. And when you go out to gather wood for yourself, a note will be marked in the journal. Once you have a journal full of notes, you will have to bring it back to your Laborer and say "Here's my notes for the day" and they will follow your notes, going to cut trees on their own and reporting to timber house. Probably, therefore, you will want to choose a laborer that performs the same things you do yourself in the game. Laborers level carrying out tasks. The more tasks they do, the more experience they will earn, and once they have gained enough experience they will be ready to level. By upgrading your laborers, you will improve their performance, they will bring back more rewards for each task you have assigned to them, and they will be able to bring you better resources. Level them, however, has a cost. Their requests will increase. They will require better furniture, better decorations to be happy, because now they feel they deserve it. As in real life, you will have to keep your workers happy. Every worker needs certain things. Maybe they want a bed or a table of better quality. However there are many ways to solve this situation. For example, by enjoying specific trophies for workers' interests, you can increase their happiness. If your workers are unhappy, as they lose happiness, they will start to bring back less and less resources from their missions, so they will start to work less hard and with less motivation. Under a certain threshold, they will stop working. They will remain inside your home. An interesting thing about the Albion Online laborer system is that they will not be able to do all the work for you. In fact, if you do not think to fill the journals to give them, you can not get to work. Remember that laborers are not a passive form of gain, but a multiplier of what you are already doing. Don't hesitate to buy cheapest gold on UPAlbion if you are in need Albion Online gold to prepare for the upcoming updates of Albion Online.